Thank you for your purchase of this nixie clock kit. Available on eBay, as either a bare printed circuit board (PCB), or with most requisite parts, less the tubes, along with the PCB. The design uses discrete 4000 series CMOS logic. It can drive 6 nixie tubes, and an optional dekatron. It has spots for HV switching supplies, though not part of the kit. 9VAC is recommended if the dekatron option is used. Either 50 or 60Hz. Current draw is dependent on the type of nixies used. Make sure the rectified and filtered DC voltage does not drop below 7.5V, or higher than 15V. This is an updated version of the board. It is Revision C. Revisions are: (1) No trace cuts required. (2) Leading “0” circuitry now included on board. (3) D9 has been switched to a full-wave rectifier bridge. (4) J3 eliminated and J6 has been modified, for external timebase references. Update – Feb 2013: Drawings for a linear supply option have been provided. Revision D boards are being sold as of May 1, 2013. 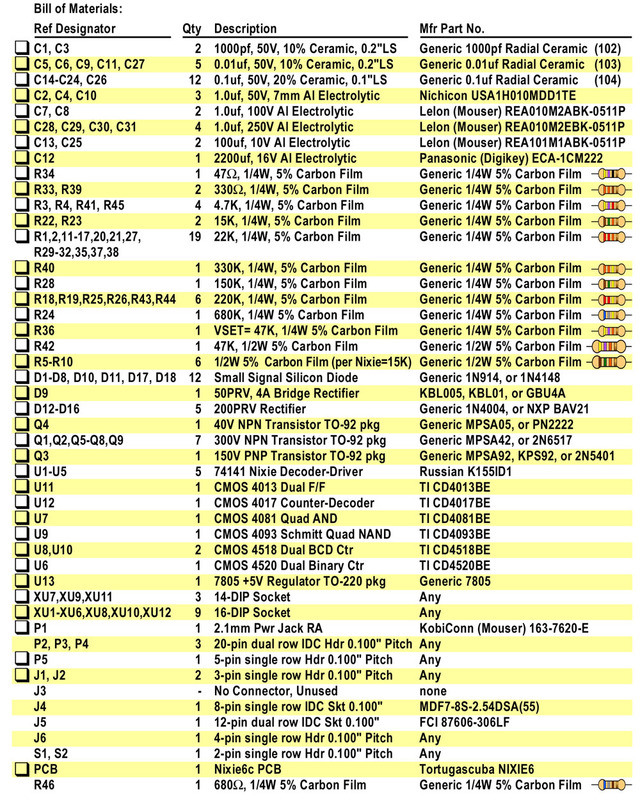 A few full Rev C kits, are still listed. The only change from C to D, are pads/holes for R45 and R46 are now added to the artwork. They no longer need to be tacked on the back (solder) side of the board. Also the silkscreen for C12 has been corrected. 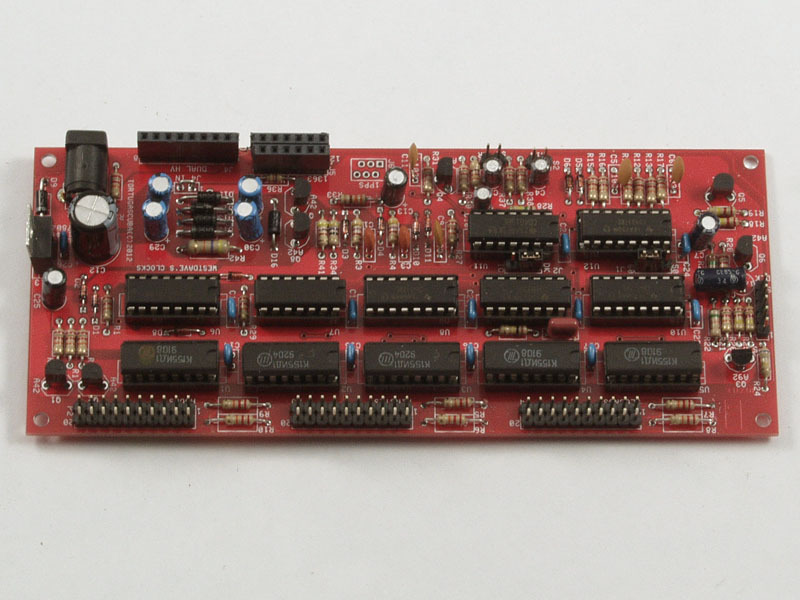 Update – August 2014: This item will only be sold as a bare board. No complete kits. The price on Russian 74141 has been creeping up, as their availability is slowly diminishing. These chips, like nixies, have not been made in decades. It use to cost me ~$70 for a batch of 100 chips. Now it cost me ~$130, and from fewer suppliers. The writing is on the wall, and I have a new kit, that uses only current production parts (other than the tubes, themselves). I initially used a 9VAC 1Amp adapter running 6 ZM1000 nixies, and a 6802 dekatron, with a Taylor 1363 switcher. The voltage drooped below 7V after a couple of hours. It could be I just had a bad wall-cube, but overseas vendors are known to miss-represent the specs on their products. To be safe use higher rated supplies, such as this one, at Jameco. Note: the photo, above, has the “leading zero” . Video is of older version, without leading zero. BTW: Its a 12-Hour Clock. This circuit uses discrete logic chips to build a simple six-digit clock. 4000 series CMOS parts were chosen to make the design simple. This is a very forgiving logic family, that can be operated over a wide voltage range, and draws very little power. Its operated at 5V, because 5 74141 TTL (or Russian version) are used to decode and drive the nixie tubes. These 5 74141 ICs uses most of the 5V current (~125mA). No programmed parts are used. The logic is mostly a string of counters, for the seconds, minutes, and hours. These counters output 4-bit binary (and BCD) codes that feed the decoder/drivers (74141), which drive the nixies. Here’s the link explaining the hours decode section. It uses a single binary counter for both “units” and “tens”. That link uses 7400 logic, instead of 4000 series, here, but functionality is the same. “Leading zero” is part of the Revision-C changes. Again its 12-hour, ONLY ! Counts from 1 to 12. 24-hour, means counting from 0 to 23. In an All hardware environment, that MEANS more HARDWARE (GET IT !). Before the hours and minutes stages there are “set” circuits, which allow the hours and minutes to be incremented with a switch each. This is a very simplistic circuit. The “incrementing” pulse from the prior stage, normally bumps the minutes, when the seconds role from 59 to 00. The other, bumps the hours, when the minutes role over similarly. In most simple counter chains this is a negative going pulse edge (+5V to 0V) . The pulse duration is not important. Here 1000pf caps with 4.7K pull-ups are used, to yield ~10uS pulses. This way, the input to these stages is almost always high. To increment a stage “manually”, via a switch, some conditioning logic is added. A simple momentary SPST (normally open) switch is used. Pressing the switch applies 5V to a RC pair. Mechanical switches are known to NOT switch cleanly, and the contacts will bounce and rattle. If no “de-bounce” circuitry was in place, a single press of the button can produce a random number of increment pulses. Possibly several hundred, per press. With this circuit a press will cause a rapid rise, but slow fall, due to the RC components. This slowed down pulse will still have some bounce jitter, but it will be reduced in amplitude. That signal in turn is fed into a Schmitt trigger inverter. That gate ensures that one pulse is generated, per switch depression, by only allowing a large swing to create a change. A diode is placed in the path to the “increment signal. These gates usually output a logic-1, which is also is the normal state of the “increment” signals. When the prior stage issues a pulse the diode is reverse biased, so the switch circuit does not interfere with normal incrementing. When a switch is depressed, the diode will be forward biased, an drag the signal down, incrementing the count. It will stay down as long as the button is held down. One count per press. Generating the 1Hz (1 Sec) pulse can be done in several ways. (a) If you do not want to add a dekatron, and have a 1pps (1Hz,1 sec) source, like that from a GPS receiver, can be used. If this option is used insert the signal into J6-pin 2. Power for the GPS can be had from J6. (+5V=J6-1, Gnd=J6-4). And omit any jumper at J2. Also, the input voltage can be either AC or DC. (b) If you still want the AC line to be your timebase, but don’t want a dekatron, use an AC power source, and place the jumper J2 to the “IC” position. That is short the center lead of J2 to the pin on the “IC” side. Short the jumper J1, center pin, to either “50” or “60” depending on line frequency, in your local. (c) Finally, if you do want to use a dekatron, AC is your only option. Short J1 per your line frequency (50 or 60Hz), and short the center pin of J2 to the “DK” side. A 4017 (U12) counter divides the line frequency to get 10Hz. This is further divided by either half of (U6) 4520, or by a dekatron, by 10 to get the 1Hz. Steering logic, cadenced by the dekatron’s NDX feedback signal, toggles the flip-flop (U11, 4013) . The flip-flop state determines the pulse order of signals G1 and G2. The order of these guide signals determine the direction the dekatron moves. The end result is the glow ping-ponging back and forth, and also still working as a divide-by-ten counter. There is no high voltage source on this board. It does, however, have two connector locations that can accommodate either a Taylor 1363 nixie supply (J5), or one of my own HV supplies in (J4). 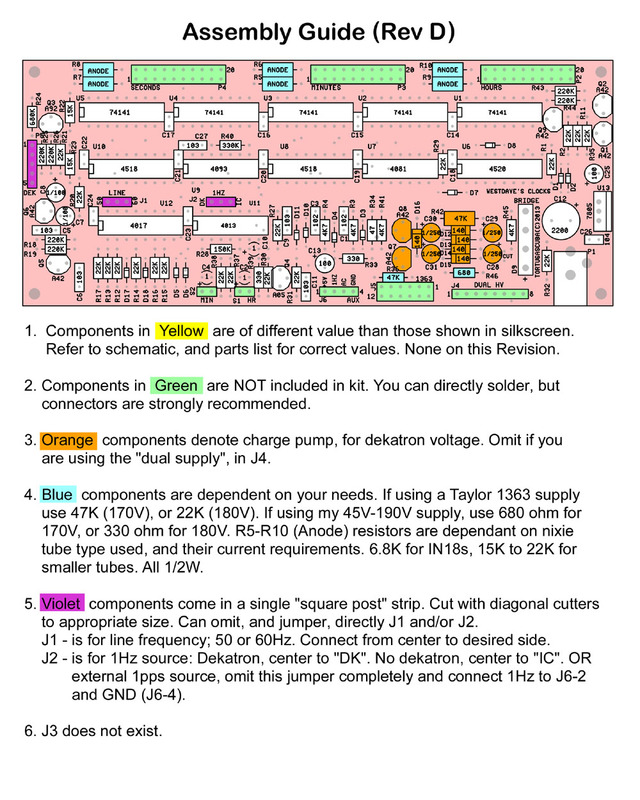 If the 1363 (J5) supply is used, and a dekatron is desired, the the charge pump circuitry must be installed. This charge pump will triple the HV coming out of J5-11. The charge pump works at around 700Hz, with a ~50% duty cycle, so common 1N4004 rectifiers can be used. No need for ultrafast rectifiers. Two types of my supplies can fit in J4. If the “Adjustable HV supply” is used, the charge pump is still needed, same as using the Taylor supply, above. Also, a 680 ohm resistor needs to be connected to the solder side of J4 from J4-6 to J4-2. If the “Dual HV Supply” (J4) is used, omit the charge pump circuitry. If installed, there will be a conflict, and the supply, and charge pump, will damage each other. Note: R46, the 680 ohm resistor is not included in Rev C kits. It is only needed if one of my “45V-190V Supplies” is used. It is not needed for the Taylor, nor my “Dual Supply”. The Power MUST BE AC (Alternating Current) !!! Either 50Hz or 60Hz into the power jack, P1, for the clock to run. It uses the AC, and divides it for the time base. If you try to apply DC to P1, the time will NOT increment, and the dekatron will not move !! You can apply an external 1Hz (TTL level) to the Aux Connector, J6-pin 2. This will make the time increment, but the dekatron will still NOT move, unless AC is applied. No cuts are required. Only the addition of one resistor across two D9, Bridge, leads. A second resistor, RX, is connected if the adjustable HV supply is used. Not needed, if the “dual supply” is used, but it can be present, and does no harm. Note: These added parts R45 (4.7K), and R46 (RX, 680 ohm), are to be made to the Rev C boards ONLY ! They have standard hole and pad locations, on the newer Rev D boards. Dekatron support, is the circuitry, on this ONE PCB that comes out at connector P5. There are 5 signals. See figure 6, above. These signals may connect to one or more pins on the dekatron. How many, is dependent on the dekatron model. Its up to you to come up with the socket, or mount. Either real or improvised. On the Hook-up diagram (figure 6), some signals show several pins, such as the RET (aka RTN, Return, or Common) signal. Connect ALL pins listed. It WILL fail, if you do not. Its an AND situation, not an OR ! Most of the dekatrons, above, are divide-by-10 tubes. The GC12/4B and GS12D are, however, divide-by-12, tubes. If you use a “div-by-12”, and you are in 60-Hz territory, set jumper J1 to “50”. Normally, with a div-by-10 tube, the time base is /6 & /10, to get /60. With a div-by-12, its /5 & /12, to get /60. If your in 50-Hz country, then set jumper J2 to “IC”, and J1 to “50”. The dekatron, will not be part of the timebase chain, and the ping-ponging will be for pure decoration. Click here for full length timing diagram. Revised June 2, 2015 – Rev A. C3 is suppose to be 47uf/250V, as opposed to 1uf, as shown in older drawing. Also this circuit should only be used with smaller nixies. A more robust circuit needs to be used for large nixies, like the IN-18. Both use the same components. Warning: the 220V version is not electrically isolated, and may pose a shock risk !